Any surfer will tell you, the best way to get good at surfing is to start as a grom. Surfing is a sport that takes a lifetime to master, and if you don't start early, you don't stand much of a chance. I'm always astounded when I hear veteran, talented surfers talking about how excited they are to go on vacation down to Costa Rica or Indonesia, or some other exotic destination, where they can surf good waves every day and feel themselves getting better. "You know, just be a grom again," they say. "Feeling like a grom" is, in all probability, the emotional state most aspired to by surfers. To capture that spirit of unbridled enthusiasm, that level of consciousness wherein nothing matters but surfing, and we have the freedom to do nothing all day, but surf, surf, surf: The feeling that got you surfing in the first place is the feeling you are always trying to recapture. As responsibilities begin to pile up on our shoulders, and our bodies slowly begin to lose their elasticity, and our recovery times from physical exertion grow longer, most surfers with real jobs, real mortgages, and real families, by necessity or by unconscious choice, just have to put the stoke on the back burner. But every now and then, on a solid few days of clean swell, or on a trip to some exotic wave-rich beach, the inner grom comes out, and you can see it in the faces of the surfers who have achieved this transformation: smiles from ear to ear, whoops and hollers and excited, detailed descriptions of the killer wave they just caught, and an absolute aversion to getting out of the water, despite all bodily signals of hunger, exhaustion, or dehydration. Of course, we all know our share of groms-for-life. Leather skinned, buff, greying lads and lasses who pretty much spend every minute of their free time thinking about surf, checking the cams, paddling out in just about any conditions; folks whose conversation rarely strays from the subject of the forecast for the upcoming days, or where you surfed on the last good day. But for most of us, life intrudes, and grom-consciousness is an elusive state. For those of you unacquainted with the lingo, a "grom" is not some buddha-like soul who has achieved surfing nirvana. "Grom" (short for grommet, that round piece of metal that you lace the drawstrings of your swim-trunks through) is merely surf-slang for "young kid who surfs all day long and has a bedroom full of dog-eared surf magazines and taped-up surf-posters and constantly harangues mom about getting a ride to the beach and is always yelling "just one more!" sometime around dusk when most adults can barely see their hands in front of their faces". Variations of the term include "gremlin", "gremmie", and "surf-rat". They are alternatively loved and tolerated, as they remind us all of how fun surfing is; and yet they also crowd out the best surf-spots in summer, and, at a certain age, develop the aggro, territorial surf-egos that a good surfing community will go to great lengths to discourage, but which naturally come with the turf of a macho, localized, physically demanding sport. This summer, on the northern beaches, while the rest of us were complaining about the heat and the never-ending flat spell, the groms were out in force on the knee-high waves that focused on a couple of prime spots in Kitty Hawk and Nags Head, tearing it up. Locals will know the spots to which I refer, but I won't contribute to the crowdedness by naming them here. Suffice to say, while everywhere else up and down the beach there wasn't even a shorebreak to ride, a couple of spots somehow managed to produce small, clean rollers, suitable for adults on ten-foot boards, but ideally suited for groms, for whom knee-high and sluggish is waist-high and rippable, and waist-high and barely rideable is chest-high, and close to perfect. In July I sat down with a few local groms in Nags Head, among them Owen McCall, Peyton Savage, Wyatt Ward, Miles McCall, Stefan Turko, Maddy Wagner, and Stephen Muglia, who have been spending the summer surfing one of these spots. After a boasting contest about who started surfing at the youngest age, we got into what it's like to be a grom. This little crowd, lovingly watched over by a community of surf-loving parents, were proud to talk about how warm the vibe is between them. "We're all friends," said Maddy. "Nobody here's got a big head." There's healthy competition, but mostly a lot of mutual cheering and trading waves. Not a whole lot of jockeying and snaking going on among this crew. Your wave is your wave, and your friends will hoot and holler if you get a good one, and offer you the next one if it's your turn. Some of them are sponsored by local surf shops like Secret Spot, known for its commitment to encouraging and mentoring young surfers, but they have measured and realistic aspirations for what part surfing will play in their lives. None of them are looking to become the next Kelly Slater. "I'll see where it takes me," said Stefan, whose older brother Quentin was profiled here previously. "So far I haven't been further than Ocracoke." But future aspirations and what-are-you-going-to-do-with-your-life questions are out of place here. It's summer, and these are the golden days of youth. For this little crew, it's all about having a good time in the water, all about the paddle-out, the ride, the camaraderie in the line-up. All about perfecting your cut-back on little waves, and dreaming of lip-smacking a solid six-foot swell sometime soon. There will be contests in the fall, and some of them will compete, some of them will choose to watch and cheer on their friends. But once the tents go down, they'll be out there together, chasing down everything from southwest wrap-arounds to nor'easter slop to hurricane swells as big as their parents will let them paddle into. Most of these kids know how good they've got it. They know they're lucky. 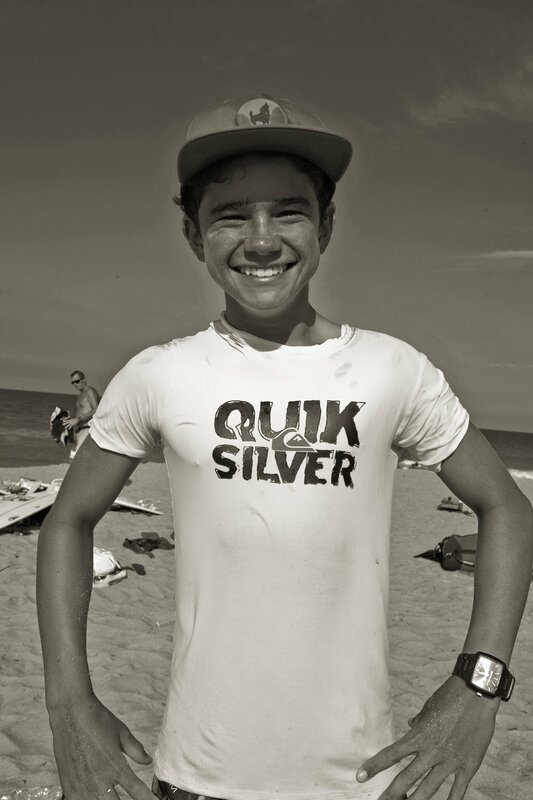 Owen and Miles go to Eleuthera in the wintertime with their parents, so they pretty much get to surf year-round. How cool is that? "Yeah, it's pretty cool," the boys grin. But growing up as a grom, at least in the tight-knit family community of the Outer Banks, doesn't breed a sense of entitlement or superiority. It's an idyllic world, for sure, but it's not an overly isolated or privileged one. They still have to deal with school, and the growing pains of adolescence, and everything else kids grow up with. But spending so much time in the water, surrounded by supportive friends and watched over by a tight-knit group of parents -- many of whom surf themselves -- instills a deep love of the ocean and a sense of kinship and respect for all those with whom they share it. In all likelihood, most of the toe-heads and teen rippers in the water right now will do stints as lifeguards and surf instructors at some point in their lives, sharing their knowledge of the sport and their understanding of the ocean with others. Some will make up the next generation of contestants, journalists, meteorologists, shapers, photographers, sales reps, and shop-owners that fuel the surf industry. Others, like the great majority of Outer Banks surfers, will find their way in some other line of work that pays the bills and offers enough flexibility to take off when the swell is good and go south when it gets too cold. And their kids, in all likelihood, will be groms.